Winter is coming. Not really to be honest, because we all know Dubai has only two weathers, hot and well, hotter but that does not get in the way of a true cycling enthusiast, does it? As the weather improves in Dubai, it’s time to put on your helmets and head out on your bikes and take advantage of this not-so-hot-weather. Don’t own one? No worries, here’s our guide to help you find your perfect ride. The Story of the Winter with Bikes in Dubai Winter is coming. Not really to be honest because we all know Dubai has only two weathers hot and well hotter but that does not get in the way of a true cycling enthusiast does it As the weath- er improves in Dubai it ’ s time to put on your helmets and head out on your bikes and take ad- vantage of this not-so-hot-weather. D on ’ t own one No worries he r e ’ s our guide to help you find your perfect ride. Racing Bikes Do you have a taste for speed and enjoy the occasional adrenaline rush Do you enjoy the wind blowing past your face as you reach mind blowing speeds Then this is the bike for you. With its alloy racing frame with Shimano Shifter alloy brake lever two-way control alloy brake racing type alloy crank Shimano Freewheel alloy pedal and Wanda 700cc tyre the Mogoo Strider is a no brainer for those who just want to go as fast as possible. 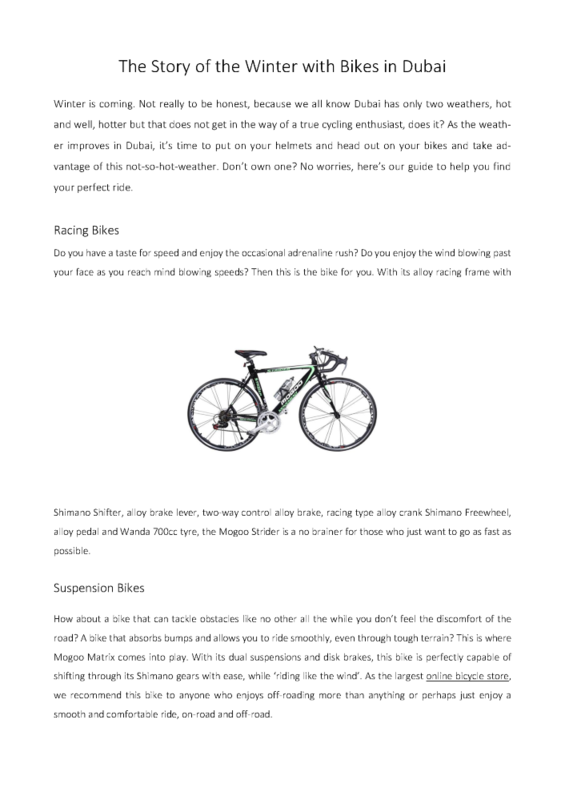 Suspension Bikes How about a bike that can tackle obstacles like no other all the while you don ’ t feel the discomfort of the road A bike that absorbs bumps and allows you to ride smoothly even through tough terrain This is where Mogoo Matrix comes into play. With its dual suspensions and disk brakes this bike is perfectly capable of shifting through its Shimano gears with ease while ‘ riding like the w i nd ’ . As the largest online bicycle store we recommend this bike to anyone who enjoys off-roading more than anything or perhaps just enjoy a smooth and comfortable ride on-road and off-road. Foldable Bikes Fancy a bike that fits in the trunk of your car No problem. Mogoo Fusion literally takes half the place a nor- mal bike would. We understand probability can be a major concern for a lot of our customers so we aim to produce a bicycle with the same capabilities of a traditional bicycle and same level of comfort but at the same time something you are able to carry around with you with no problem. With Mogoo Fusion don ’ t let that inconvenience stop you anymore. Freestyle Bikes Maybe you just enjoy a little freestyle once in a while A bike that can handle 3 6 0 ’ s with incredible ease Why not take the Mogoo Ski bike for a ride I t’ s your perfect companion no matter who you are you will find one to match your style of fun. So hope on and relive your childhood dream and feel the rush. Cruiser Bikes Simply prefer old school Something to cruise around in a park maybe Mogoo Fiesta will take you back in time and bring back the good old days. With its unique design and character the Mogoo Fiesta stands out in the crowd and will most definitely turn heads. It is an analogue in a digital age for those who believe in old is gold. For the little ones Feeling out of place Mogoo offers a wide range of bicycles and other toys for our younger generation stay- ing true to our ultimate goal putting a smile on all our customers irrespective of age with our wide range of products and incredible variety. We at mogoo understand and believe in this enthusiasm and passion for bicycles. Our goal is to produce the perfect ride suitable for all our customers from the little ones with training wheels to the enthusiasts with a taste for adrenaline. We aim to please our customers by providing a wide range of products with a variety of choices. Our commitment to churn out the best of bicycles is our identity in itself. So what are you waiting for Pop in our store or visit our website http://dubaibicycles.ae/ to choose your perfect ride right now.